翻訳 KEO discussion paper. G : "Inter-disciplinary studies for sustainable development in Asian countries"
Solar power generation, especially space solar power, is one of the most promising alternative technologiesfor reducing CO2 emissions. 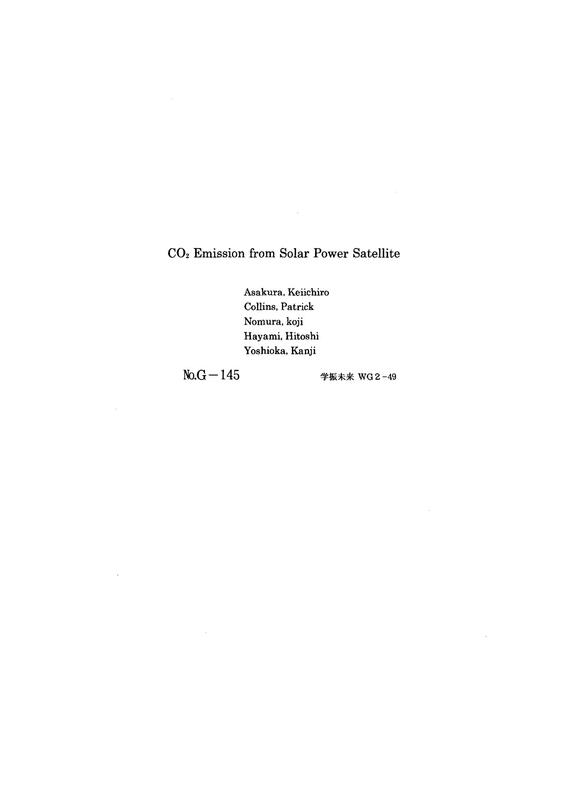 However its potential is not obvious, because the launching ofsatellites consumes rocket fuel, and because solar panel production also involves energy consumption.For this paper we calculated CO2 emissions through the life cycle of a Solar Power Satellite (SPS),which comprises production of rocket fuel, solar panels, construction of Rectenna (power receivingantenna), satellite and all equipment listed in the NASA/DOE Reference System. The calculationalso includes indirect CO2 emissions estimated from 1990 Japanese Input-Output Tables broken downinto 405 sectors.The baseline scenario shows that CO2 emissions from SPS per unit of energy generated, at 20gCO2 per kWh, is almost the same as from nuclear power systems at 22g CO2 per kWh, and muchless than LNG-fired power generation at 631g CO2 per kWh, and coal-fired energy at 1,225g CO2per kWh. Furthermore, the SPS-Breeder scenario (in which installed Solar Power Satellites supplyelectricity for producing further SPS units) shows significant improvement in CO2 emissions at only11g per kWh.In spite of Japan's high dependence on nuclear power (which currently provides 32 % of the totalelectricity supplied), electricity causes one fourth of Japan's total CO2 emissions. This paper suggeststhat the SPS is the most effective alternative technology for further CO2 reduction in electric powergeneration.